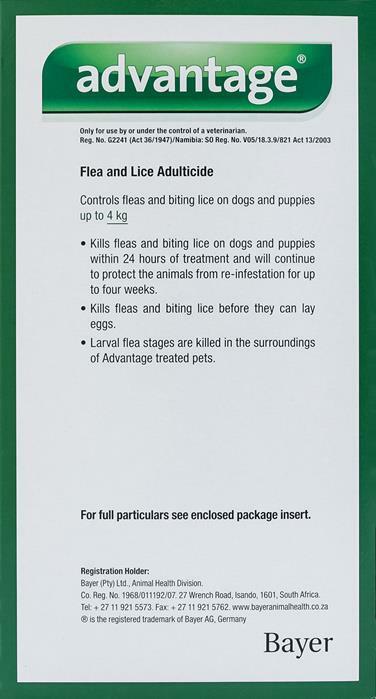 Advantage Green for dogs provides fast relief from fleas. Advantage kills fleas on contact with your puppy or kitten too. Just follow the weight range directions. It spreads throughout the oily layer of your pet’s skin covering every precious inch of your favorite couch-warming companion. Hi, All products are well within expiry dates. Generally the items are manufactured about six months ago with a three year lifetime, so on average you have about 2.5 years before the expiry date is reached. I was happy with the service, the product and the prices thank you!